The Dioxide Pacific O3Pure ozone system is a complete turnkey stainless steel skid mount package for disinfection of spring, bore or purified water for production bottling, bottle rinsing, cap rinsing or CIP sanitization using ozone generated from air or oxygen feed. The system is fully automatic and can include mechanical and electrical installation by our engineers at your site. Why is ozone good for bottled water disinfection? Ozone is a popular method for disinfection of spring water prior to bottling. Ozone is a powerful oxidant and will react quickly with bacteria, virus and cysts at low ozone concentration. When employed in a multiple barrier approach, pre-treatments such as cartridge or membrane filtration and UV disinfection followed by ozonation will achieve disinfection of water whilst adding a small residual of ozone to overcome any hygienic inadequacies at the filler and in the bottle itself. Decay studies have shown that ozone residual can be maintained in PET bottle for hours to days, thereby achieving CT and preventing bacterial regrowth. Bromide ion reacts with ozone to form bromate ion which is deemed to be harmful to health, with the aim to maintain bromate concentration below 10 ppb. Manganese will react with ozone to form Manganese Dioxide which is a black precipitate. Further ozonation will form permanganate which will impart a pink color to the water. Aliphatic compounds will react with ozone to form aldehydes and carboxylic acids which may or may not be significant depending upon the original organic compound concentration. Ozone is only sparingly soluble in water and since it is a gas, it follows Henry’s Law. The concentration of dissolved ozone is proportional to the partial pressure of ozone in the air above the water. Ozone is usually generated using corona discharge of either air or oxygen. Generation from dry (dewpoint < -60 deg.C) air can produce ozone in air a up to 20 g/m3. Generation from either pure (99%) or PSA generated (90-95% in nitrogen) can produce up to 150 g/m3. Higher gas concentration leads to higher dissolved residual. Dissolving of ozone gas in water is usually accomplished with either a venturi, static mixer or diffuser stone. 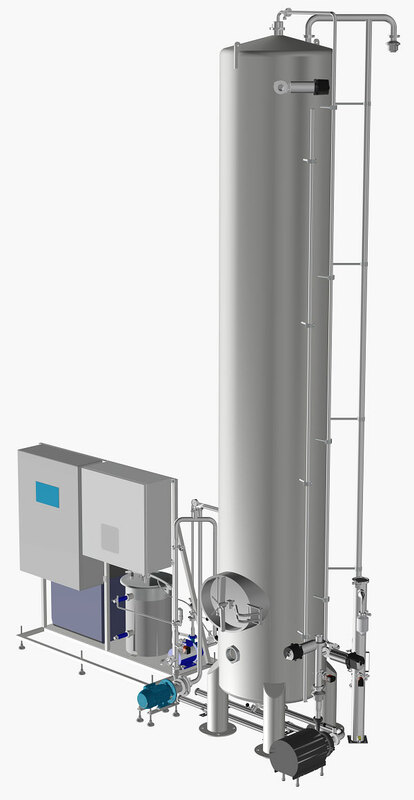 Both venturi and static mixer require minimum flow and pressure to create the energy necessary to dissolve the ozone. This flow and pressure can be provided by a pump. Mass transfer greater than 90% can be obtained with both venturi and mixer. The diffuser stone is a porous ceramic block through which ozone gas is fed under pressure. The small holes in the stone create small bubbles which dissolve in water as the bubble rises through the water column. Using a venturi or static mixer, water can be ozonated in either a atmospheric or positive pressure reaction vessel. Raw water can be fed into the top of an atmospheric contact tower. Ozone can be added into the water as it enters the tower or at the base of the tower. Ozonated water is pumped to the filler. With a pressurized vessel, water is ozonated as it enters the vessel. Ozonated water flows through the vessel which is sized for a particular contact time and to the filler. The pressurized vessel operates more efficiently as it is not open to the atmosphere and therefore ozone gas is kept dissolved. Not all ozone dissolves in the water so the excess will exit the top of the reaction vessel. This ozone is usually destroyed so it does not accumulate in areas where operators are working. Ozone gas reacts with activated carbon to form carbon dioxide which can be safely discharged. One disadvantage of carbon is its ability to be a bacterial growth medium. Catalytic media is available which will convert ozone to oxygen in around 1s contact time. The advantage of the catalytic media is that it is not consumed in the reaction. Modern systems require ozone residual to be controlled to low concentration (0.1 – 0.2 ppm) and within tight tolerances (+/- 0.05 ppm) to minimize bromate formation. It is rare for bottling flow to be steady state with ramp-ups and ramp-downs, slowing and stoppages due to filler, capper or labeler problems. Therefore, the ozone contact and residual control system must be able to cope with all flow scenarios and produce water which conforms to the desired residual specification. To achieve this, a combination of plug flow and CSTR (Continuous Stirred Tank Reactor) must be employed with PID control from the ozone analyzer and perhaps the addition of flow feed-forward. Ozone residual analyzers must be installed to ensure accuracy and repeatability under all all flow conditions. Amperometric ozone sensors which use membranes and electrolyte are the most common. These sensors require calibration using a photometer. Note: the accuracy of photometer measurement is not greater than +/- 0.03 ppm. What Does the Plant Look Like? - Specify flow in m3/hr ? S Production with ozone sanitization step (1.0 – 2.0 ppm) ? 0.05 Ct = 0.05 mg/L.min ? 0.1 Ct = 0.1 mg/L.min ? 0.5 Ct = 0.5 mg/L.min ? 1.0 Ct = 1.0 mg/L.min ? 2.0 Ct = 2.0 mg/L.min ? 4.0 Ct = 4.0 mg/L.min ? P In-line Pressure Vessel ? V Vertical atmospheric tower ? BM By-pass static mixer ? PO ProMinent Amperometric Ozone Sensor ? EO Emerson ozone residual ? 1 Manual butterfly valve ? 2 Pneumatically actuated butterfly valve ? 1 Fristam Hygienic on/off ? 2 Fristam Hygienic with VSD speed control ? 3 Pneumatically actuated control valve (4-20mA) ? FP0 Not included or not applicable ? FP2 Fristam Hygienic on/off ? FP3 Fristam Hygienic with VSD speed control ? 0 Rockwell CompactLogix PLC and Red Lion 7 inch HMI ? 1 Rockwell CompactLogix PLC and PanelView Plus 7 Performance 10 inch HMI ? 2 Rockwell ControlLogix PLC and PanelView Plus 7 Performance 15 inch HMI ? 3 Rockwell CompactLogix PLC and PanelView Plus 7 Performance 15 inch HMI ? 4 Panasonic FP0H PLC and Red Lion 7 inch HMI ? 1 Loop powered transmitter with alarm on HMI ? 2 100-240V powered transmitter with panel meter alarms ?